A super fast-acting and easy-to-use tan mousse with pHenO2 Technology for instant colour and a natural-looking tan that lasts up to 2-3 weeks. With Odour Remove Technology for zero smell, Moisture Locking hydration and certified organic botanicals. For the longest-lasting tan, apply three times over 12 to 24 hours, showering with water only before each application. Ensure skin is clean and exfoliated. Use the Tan Mitt included and, with two to three pumps at a time, apply with circular movements. Use sparingly on hands, feet, knees, and elbows. Do not moisturize prior to application. If naturally pale, leave longer before showering. 125 mL / 4.2 fl. oz. The Vita Liberata team are passionate experts in luxury tanning. From their Irish base, they created the world's first odourless tan in 2007, and the unique Odour Remove technology is now present in all of their self and spray tans. 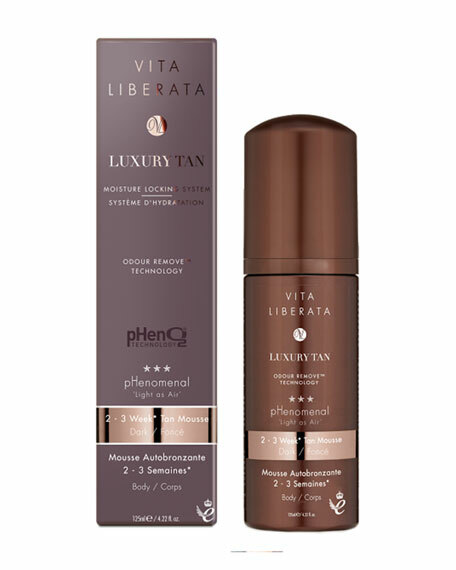 In 2011, Vita Liberata became the first completely non-toxic tanning brand. This led to Vita Liberata being listed in the world's top spas. Founder Alyson Hogg says, "I am passionate about creating real alternatives to sun exposure. We use the smartest technology and the purest ingredients to deliver the most natural results. Choose with confidence. Every product was made with you in mind." Clarins Self Tanning Instant Gel, 4.4 oz.